Jane Kelly, owner of On the Wing rehabilitation center, in Epping, N.H., holds a barred owl recovering from being hit by a truck and becoming lodged between the vehicle's cab and cargo hold. Heading home to New Hampshire, truckers Will Sword and Tyler Buckley were on the road in Massachusetts when they heard a bang. At first, they thought the truck had hit a tree. But when they stopped and Buckley got out to investigate, he was shocked to see an owl trapped between the cab and the cargo hold. And it was still very much alive. 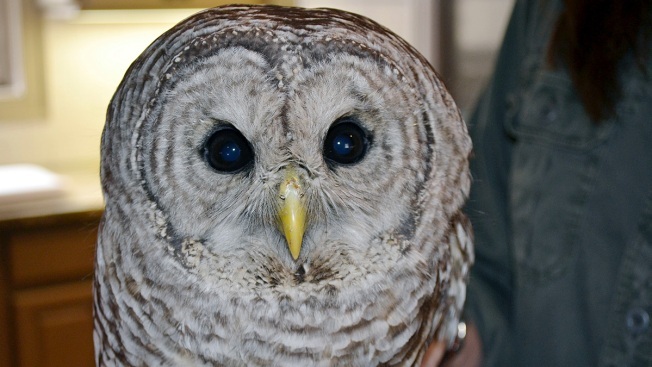 "He said, 'Dude, it's an owl,'" Sword said, who snapped a photo of the male barred owl trapped earlier this month. He recalled it was flapping its wings and trying to escape. Sword got on the phone to the New Hampshire State Police, who referred him to Jane Kelly, who runs a rehabilitation and education center in Epping for birds of prey called On the Wing. She advised him to gently remove the bird from the truck with heavy gloves to avoid the sharp talons, keep it warm with a blanket and place it in a box. "It's absolutely a miracle that it's alive after getting hit by a truck," said Chris McKee, a conservation officer with the New Hampshire Fish and Game Department, who picked up the bird the next day and brought it to Kelly. He said the owl was most likely trying to hunt for rodents along the highway when it collided with the truck. Kelly brought the bird to Veterinary Emergency & Surgery Hospital in Brentwood to be examined. It didn't appear to have any broken bones but did suffer head trauma in the collision and is having trouble seeing out of its right eye. Named Trucker, the bird has been recovering, eating and perching on its own. Kelly said it should be moved this weekend to a larger enclosure and eventually be released into the wild. "If he can fly, then we will start seeing if he can hunt on his own with live prey and hopefully get him out to where he came from in the next couple of weeks," Kelly said.